As Angus Calder states in his introduction to this edition, Seven Pillars of Wisdom is one of the major statements about the fighting experience of the First World War. Lawrence's younger brothers, Frank and Will, had been killed on the Western Front in 1915. Seven Pillars of Wisdom, written between 1919 and 1926, tells of the vastly different campaign against the Turks in the Middle East - one which encompasses gross acts of cruelty and revenge and ends in a welter of stink and corpses in the disgusting 'hospital' in Damascus. Seven Pillars of Wisdom is no Boys Own Paper tale of Imperial triumph, but a complex work of high literary aspiration which stands in the tradition of Melville and Dostoevsky, and alongside the writings of Yeats, Eliot and Joyce.. Seven Pillars of Wisdom was a fascinating read. 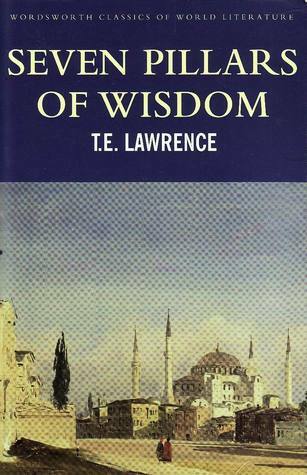 Before picking up this book, all I knew of Lawrence came from the Lawrence of Arabia film. I love that movie, but reading Lawrence's account, it's interesting to see where they changed things for dramatic effect. Lawrence is fairly self-deprecating in the narrative, listing many regrets. At times I was surprised with how much he shared on certain topics (given the time in which he was writing), but I'm sure even then he will have been holding back on some things. Although essentially a war journal, this is never dull reading thanks to Lawrence's literary flair. You really get a sense of the desert, and the people around him, thanks to his storytelling and descriptive skills. This is not a book for someone seeking a light read, but it is a worthwhile one for those willing to work through the 650+ pages.